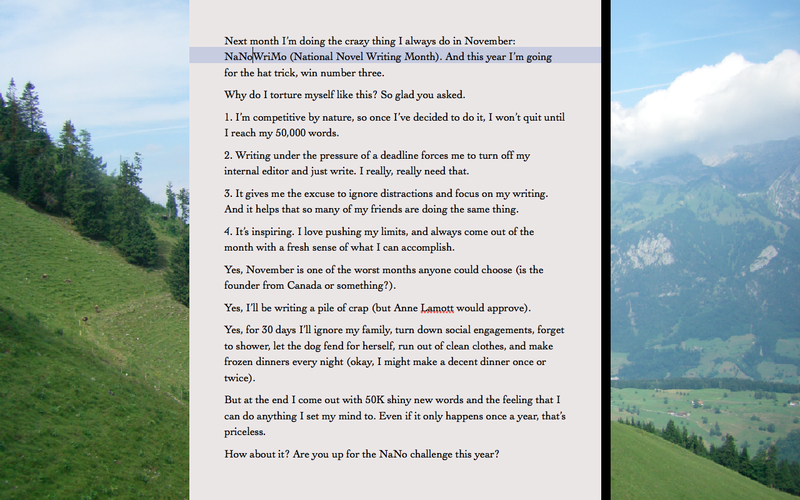 NaNoWriMo is coming! Worried about how you can reach your 50K words? Scrivener can’t do the writing for you, but it can certainly make the job easier. Here are some of Scrivener's best features to help keep you on track when you’re burning up the keyboard. Staying on track for NaNo is not easy, but keeping track of your progress is a cinch if you use Project Targets. 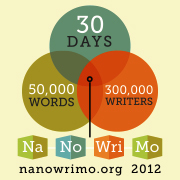 You know you need 50,000 words, 1667 per day if you write all 30 days. 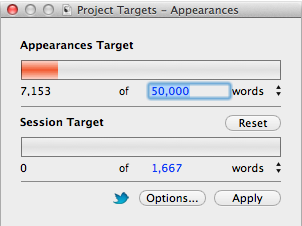 Set up your overall word count goal, and then a session goal for each time you sit down to write. The colorful progress bars will show you how you’re doing. Mac users can use the Deadline setting under Options to calculate the session target automatically based on the days you plan to work. And when you're done, you can tweet your results right from the Project Targets window by clicking the blue bird! For more on Project Targets, check out this post. If you’re like me, you write better without distractions. Scrivener has you covered with Composition Mode (Mac)/Full Screen Mode (Windows). You can change your background color to whatever gets your creative juices flowing and block out everything else. Mac users can even change the background to an image. Haven’t figured out that line of snappy dialogue? Need a fact, but don’t want to stop your momentum to research it? Insert an annotation and get back to work. Annotations are colored bubbles of text that you insert directly into your writing. They’re easy-to-spot reminders that something needs fixed, but later, after NaNo. And when you’re ready to make the changes, they’re simple to find again. Click here to learn more about annotations. Also, consider creating a Change Log or Ideas Log document in the Binder to store ideas for earlier scenes, or those that might come later in the manuscript. You can jot down an idea when inspiration hits, and then get back to writing. When NaNo is over, your ideas will all be waiting. Need quick access to your character’s names and/or basic info? Or your descriptions of locations? Or a reminder of what special power each character has? Whatever it is, in addition to storing a complete document in the Binder, you can put an abbreviated list in the Project Notes section of the Inspector panel. Not only does this make it available without leaving the document you’re working on (or using split screen), but you can view the Project Notes pane from Composition/Full Screen view. Don’t forget to import your must-have research, notes, references, and images before you get started. By storing key items within Scrivener, you won’t have to waste time hunting them down when you’re in a crunch. Remember to breathe, relax, and have fun. Even if you don’t reach 50K, you’ll come out knowing you gave it your best shot, and you’ll likely have more words than you otherwise would have.